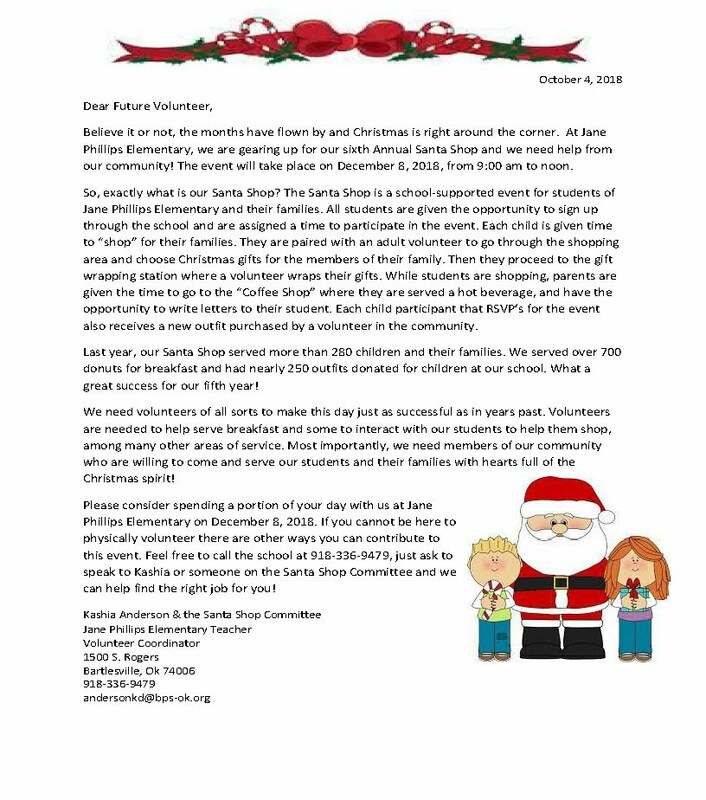 Each December, Jane Phillips Elementary School operates a Santa Shop so many of its students can go "shopping" to select Christmas gifts for members of their family. The sixth annual Santa Shop will be conducted on Saturday, December 8, from 9 a.m. to noon. Community volunteers are needed. All students at the school can sign up for the event, and are assigned a time to participate. The student is paired with an adult volunteer to go through the shopping area to choose gifts. Another volunteer then wraps their gifts. While students are shopping, their parents can relax in the "Coffee Shop" where they are served a hot beverage and have the option of writing letters to their student. Each child who signs up in advance also received a new outfit purchased by a community volunteer. In 2017, the Santa Shop served more than 280 children and their families. Over 700 breakfast donuts and nearly 250 outfits were donated. Volunteers are needed to help serve breakfast, help students shop, and more. If you cannot be present to physically volunteer, there are other ways you can contribute. Please call the school at 918-336-9479 and ask to speak to Kashia or someone on the Santa Shop Committee.